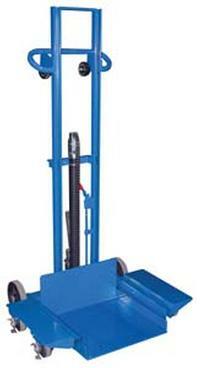 Lift and transport loads from delivery trucks to docks or use to inventory items on storage systems. Easy to operate with either a hand crank or foot pump. Available in steel or aluminum construction. 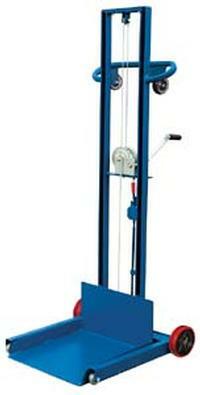 The platform lifts approximately 1" per winch rotation or foot pump stroke. Models with the suffix -FW (Pic. 4) roll smoothly on 6" x 2" poly-on-poly rear wheels with 2" semi steel front wheels. Models with the suffix -4SFL (Pic. 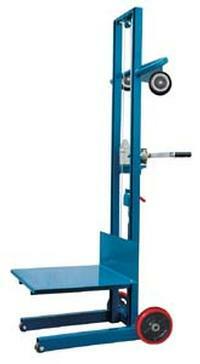 6) have 8" x 2" poly-on-poly rear wheels, four swivel casters, and a hand operated floor lock. Located on the handle are two rollers to ease loading into delivery trucks. Horizontal load center is 10". Low profile units (Pic. 6) have a deck height of 1/4" with a 2" high side lip.